On the 6th of December 2017 an interesting auction of lighters took place. 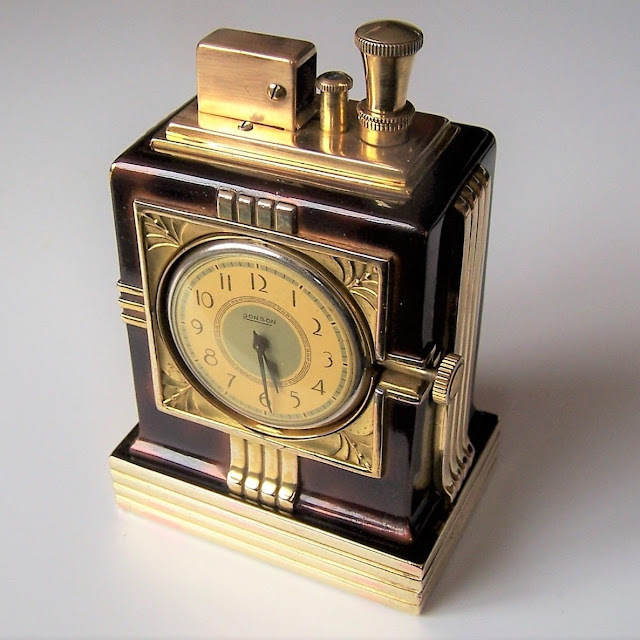 Almost 50 lots were sold among others such rare table lighters like: German Henckles Plane, GE Transformer Zippo, Dunhill Clock and Marconis Souvenir Disc Discharger Lighter. If you are a buyer you have to add a 25% premium to the "sold for" price. 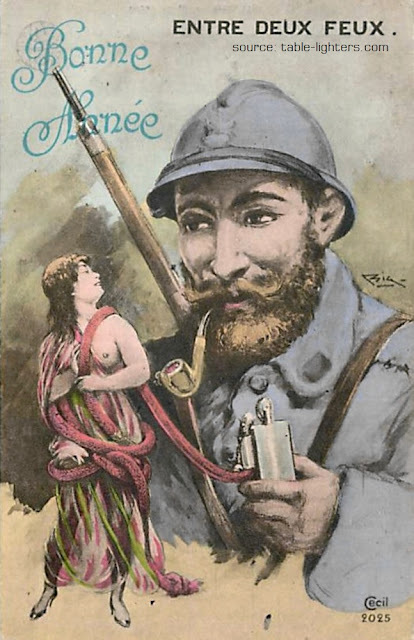 This postcard shows a soldier holding a fox-hole lighter which rope is entangled around a burning woman. A disturbing view! The postcard was designed by "Edition SID Paris" and printed in France between 1914-1918 (World War I). On the reverse of the postcard it is written "Vise Paris no au verso" (ECIL 2025). On the front of the postcard there are two expressions: "Bonne Année!" (eng. Good year!) and "Entre Deux Feux" (eng. between two lights). 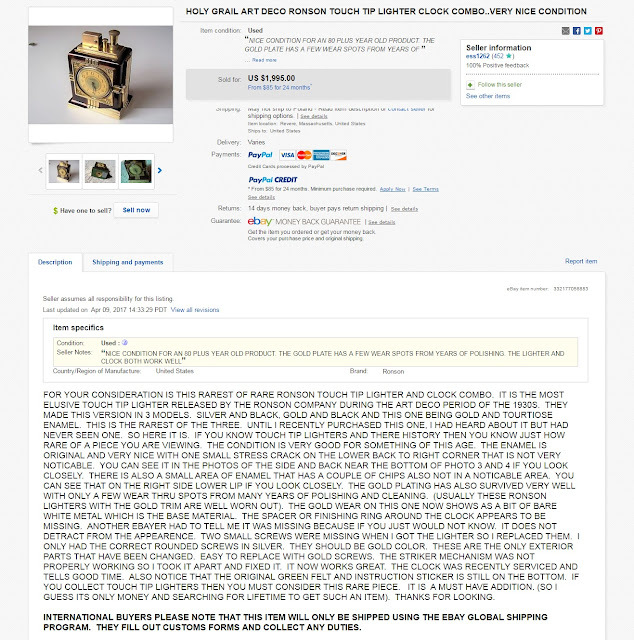 Few days ago (9th April 2017) an extremely rare Ronson table lighter was sold on eBay for $1,995. It is, in my opinion, the best looking clock combination Touch-Tip lighter made by Ronson. 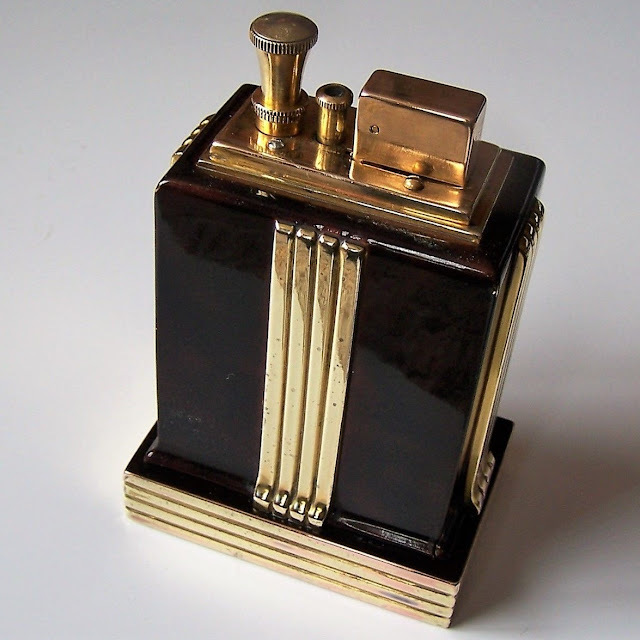 It was manufactured in the late 1930s in two finishes: chrome plate with black or tortoise enamel and gold plate, also with black or tortoise enamel. The price is adequate to the very good condition of the sold example. 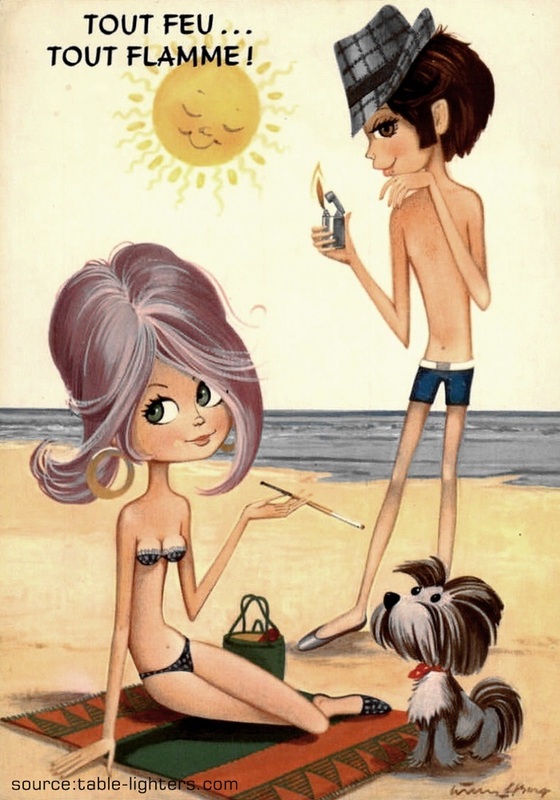 This cartoon postcard showing a girl and a boy lightning up his pocket lighter was issued in France (printed in Belgium) in 1970 by Editions Chapeau Nantes — S.P.A.D.E.M. (Paris, France). On the reverse of the postcard it is written "41 — Vacances de Jeunes" which suggests that it was intended for the youth on vacation (sic!). "Tout feu... Tout Flamme!" is a expression that might be interpreted in English as: "To burn with enthusiasm!" or "All fired up!". 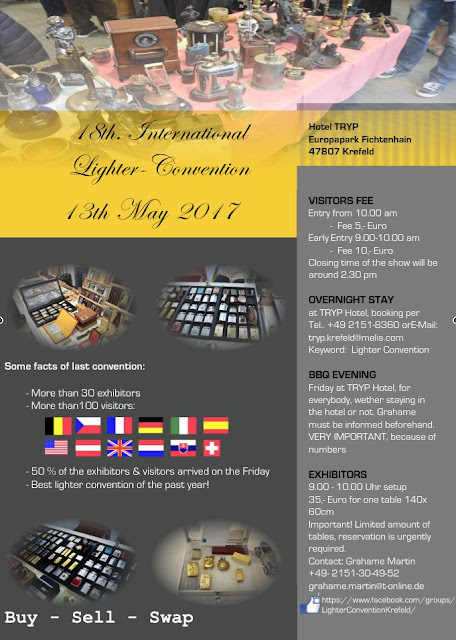 On the 13th of May 2017 the 18th International Lighter Convention in Krefeld, Germany will take place! Table holders can set-up from 9:00 to 10:00 AM. More info can be obtained from Grahame Martin: grahame.martin@t-online.de. I hope to be there!